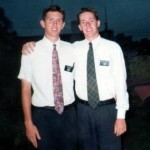 Elder Loesener and I in Paraná, Argentina the morning of my first transfer. 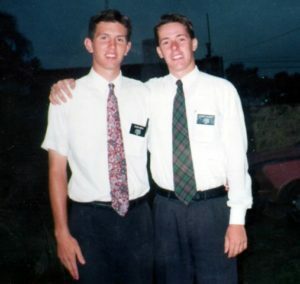 In April of 1996, after three months in my first mission area (Gazano Branch, city of Paraná, Argentina), I received my first transfer to another area when I was asked to go to the city of Santa Fe. I was transferred to the Rural Ward of the Santa Fe Stake. Paraná had been great, we worked hard, and we baptized two families. 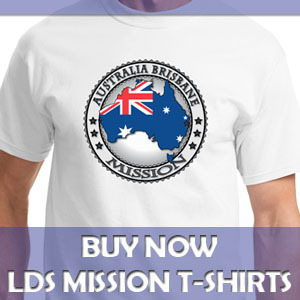 Most of this success, of course goes to the Lord, and to my great first companion and trainer, Elder Loesener. The night before I left the area, we were out until 10:25pm teaching what was, according to my journal, “the best first discussion we ever gave.” The man was very receptive to the message of the restored gospel of Jesus Christ. After we finished, we had to run back to our apartment and jump right in bed to meet our 10:30pm bedtime schedule. And if I recall correctly, I think we made it. The next morning, I got up at dawn and headed to the bus station. Santa Fe is about a 45 minute bus ride from Paraná. I was very nervous about being on my own, buying a ticket, and getting myself to my new area. At the bus station, I went to three different windows before I found the right place to buy a ticket. Then, for fear that I would miss the announcement for my bus departure, I sat myself down by the us and watched the bus like a hawk (for about an hour) until it was time to board. Soon the bus left, and luckily, I was on board. Then in Santa Fe, I got a taxi and made it smoothly to my new area. 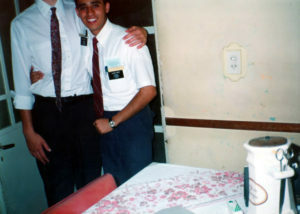 Our landlord took this photo of Elder Pinto and I. This was in the day of film cameras, so I couldn’t see the photo right away. But I highly suspected one or both of us were cut out of the shot. My new companion was Elder Pinto from the city of Mendoza, Argentina. 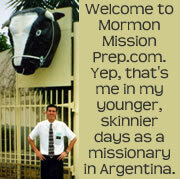 Elder Pinto, unlike my first companion, didn’t speak any English. My Spanish was still pretty weak at this point, so it was a tough few weeks we had together. On my first day with Elder Pinto in the city of Santa Fe, it was lunch time and we didn’t have a lunch appointment with a member family, per the norm, so we went to a little corner store together. Elder Pinto bought hot dogs and I bought some crackers and cookies, among other things. When we got back to our apartment, Elder Pinto cooked up one of the hot dogs and offered it to me. I politely declined because I really do not like hot dogs (ok, they completely disgust me). It was then that Elder Pinto admitted that he didn’t like hot dogs either. He thought all Americans liked hot dogs, and since we were not communicating very well, he wanted to be nice and buy something for me that I would like. We got a good laugh out of that one, as we sat there in our apartment, with a big package of hot dogs that neither one of us wanted to eat. 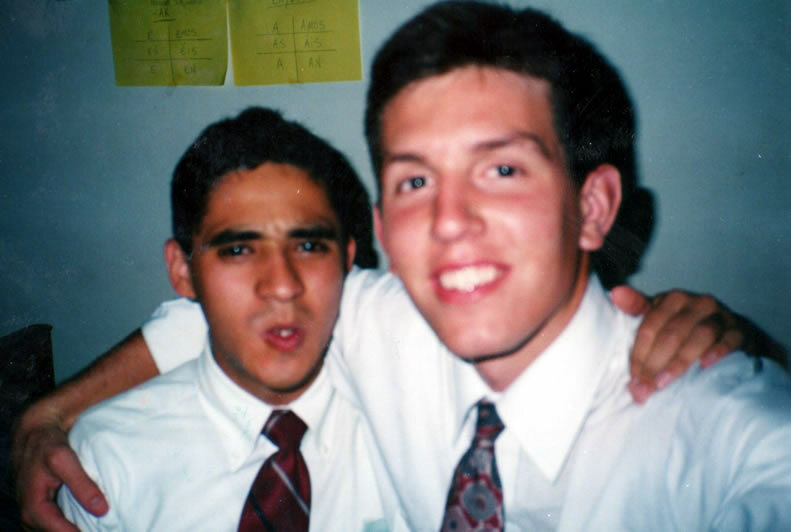 Suspecting that the first photo turn out, I took this one of Elder Pinto and myself as a backup. The Rural ward in Santa Fe was big, averaging well over 100 people per week in sacrament meeting, and they also had a nice, large, Church-owned building to meet in. This was a huge contrast to my first mission area where I was in a small branch, with about 25 people attending per week, and meeting in a small rented home. Another major difference was that my first area was on the outskirts of the city and had many middle-class neighborhoods and dirt roads. My new area was much more urban, with tall buildings, apartments, and also some very poverty-stricken, run-down neighborhoods. Elder Pinto and I were only together for one month before he was transferred to another area. He was a great companion, but it was difficult not being able to speak English to him or anyone else for a whole month. During that time, I can remember dreaming through the night in English, only to wake up and realize that I had to speak Spanish all day. For a newby like me, this was a major effort and the thought of having to speak Spanish all day long was daunting. But I made it through, and this probably helped my Spanish language abilities tremendously.